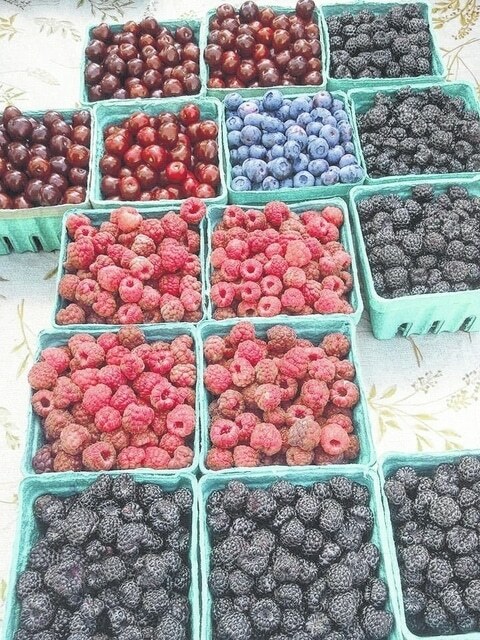 Berries from Fairview Orchard are displayed during this week’s Farmers Market in Galion. Two Avita Hospital culinary workers will take part in next week’s NorthSide Farmers Market, which will be held from 4:30-6:30 pm. Tuesday. Chef Jeremy Schrote and Director of Nutrition Wade Cramer will prepare food from vendors on site including kohlrabi slaw, new potato home fries and a farmers market sandwiches. According to a press release from city officials, Tuesday’s market will also include local artists and craftsmen showcasing their handmade products, including handmade soaps, leather goods, baskets and more. Vendors include The Edible Landscapes, That’s My Farmer, Fairview Orchard, Green Patch Garden, Heritage Harvest Farm, Laughing Hills Stock Farm, Roseberrys’ Homemade, Pickwick Produce, 8 Sisters Bakery, Bills Bakery and Heavenly Suds Soap. Craftsmen include Clutter Baskets and Caning, Heavenly Hands Quilting, Country Angel-Rusty Star Primitives, Leather Designs and others. The market offers fund-raising opportunities for local non-profit organizations. Call 419-468-1857 for information. CAR SHOW SET – The Bringing Back the Past Car and Cycle Show will be held 10 a.m.-4 p.m. July 5 at Heise Park. AMERICORPS MEMBERS SOUGHT – The Bucyrus Public Library was chosen by the State Library of Ohio to take part in the Guiding Ohio Online AmeriCorps program. Guilding Ohio Online was developed to help rural libraries teach patrons to find, understand and use online resources and services. The library and program are looking for applicants committed to community service to hire part-time for an 11 month term of service as an AmeriCorps members to start Oct. 1. Members will lead computer classes, offer one-on-one computer training and recruit volunteers for the library. For more information, call 419-562-7327, ext. 102 or 614-466-1710.